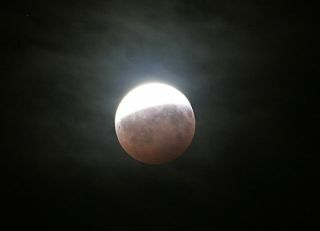 An image of the lunar eclipse on August 16, 2008 was taken from Rome, Italy by Gianluca Masi and Valentina Romeo of the Virtual Telescope Project. They used a Canon 30D and a Canon 200mm lens. Two weeks before a total eclipse of the sun crosses over the South PacificOcean, the moon will put on a sky show of its own — a partial lunar eclipse onJune 26 that should be visible from parts of North America, weather permitting. The lunareclipse will occur in the early morning hours of Saturday, June 26 as themoon crosses through the southern portion of Earth's shadow in the constellationSagittarius. At least some of this interesting event will be visible fromwestern and central North America. These, in fact, are the filtered glows of innumerable sunsets and sunrisesoccurring around the rim of the Earth at the time. But partial eclipsesgenerally lack the colorful orange-red hues that a total lunar eclipse oftenshows. At this upcoming eclipse, no more than 53.7 percent of the moon?sdiameter dips inside the dark central core of the Earth?s shadow, which iscalled the umbra. That leaves almost half of the moon?s disk in the shadow?souter fringe, known as the penumbra, where a generous dose of direct sunlightstill reaches the moon; so the southern half of the moon will appear subduedbut otherwise near normal. Glare from this sunlit portion will make any coloration within the umbraelusive at best. Your best hope of detecting colors is to view the moon with a100-power (100x) telescopeeyepiece or more and maneuver it so that the bright half lies completelyoutside the field. Unlike a solar eclipse, whose aspect depends very greatly on an observer?sparticular location on Earth, a lunar eclipse looks essentially the same fromany of the Earth where the moon is above the horizon. Since the moon will set during the course of the eclipse, some of the stageswill not be visible because it will have disappeared below the west-southwesthorizon. Here is a timetable of observing times across North America. The first bit of shading will become evident around 5:50 a.m. EDT (0950GMT), when the moon?s upper left portion has moved about two-thirds into thepenumbra of theEarth?s shadow. The shading will darken for the next 25 minutes orso. Then at 6:17 a.m. EDT (1017 GMT), the disk?s northeast (celestial northeast)enters the dark umbra. At this time the moon is setting (and the sun isrising) along a line running from northwest to southeast from roughly Winnipeg,Manitoba to Savannah, Georgia. The moon will have already set for observers farther north and east. For another 83 minutes the dark bite in the moon?s edge enlarges untilreaching maximum eclipse at 7:40 a.m. EDT (11:40 GMT). Now the umbra extends 54percent across the disk. But eastern observers are progressively being shut out of the action. By nowthe moonset and sunrise lines have shifted west to run from Saskatchewan,Canada, to east Texas. The moon leaves the umbra at 9 a.m. EDT (1300 GMT), when it is just minutesfrom setting as seen from along California?s Pacific Coast where the local timewill be about 6 a.m. The last bit of penumbral shading should be visible around6:25 a.m. local time. The entire umbral phase is visible throughout the Pacific, New Zealand,Australia, and Japan. From these locations, the eclipse will take placeduring Saturday evening, June 26. The point where the moon isdirectly overhead at maximum eclipse lies over the South Pacific Ocean, far tothe southwest of Hawaii. The next lunar eclipse is a total one later this year on the night of Dec.20-21, which will be visible from the Americas as well as western portions ofEurope.